Considering MSE at Ohio State? The Materials Science and Engineering program at Ohio State is one of the top programs in the country, highly ranked by U.S. News & World Report. The undergraduate curriculum is monitored to ensure the best preparation possible for our graduates as they pursue jobs in industry or graduate school opportunities. The core of the MSE curriculum is made up of 55 credit hours of courses in the major. This includes lecture courses, labs and a year-long senior research project, all designed to give MSE students the critical foundation of knowledge needed to work in the field. Prior to the senior year, students select a focus area designed to bring a focus to their upper level study. Students may focus on Biomaterials, Ceramics, Electronic Materials, Metallurgy, or Polymers. With help from a faculty advisor, students may choose senior-level materials electives from variety of courses, based on one's interests and goals. 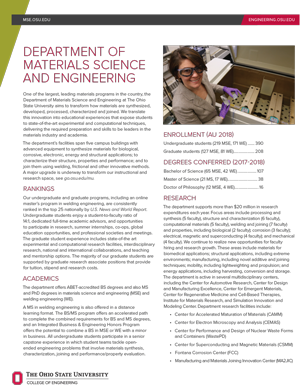 Students interested in pursuing a bachelor's degree in Materials Science and Engineering will begin as "pre-majors" in MSE, and should follow the curriculum sheet, taking the required courses in Math, Chemistry, Physics, and Engineering. Students should take MATSCEN 2010 no later than the Autumn before entering the major. MSE Major courses begin in the Spring Semester of the second curriculum year. MATSCEN 2010 is offered each year in the Autumn and Spring semesters and has a prerequisite of Math 1151, Chemistry 1250 or 1210, and Physics 1250. The MSE program at Ohio State offers students the best of both worlds! The MSE department is a small, friendly department where students interact frequently with faculty and staff and have many opportunities for activities and research. At the same time, Ohio State offers hundreds of clubs and organizations and ways to be involved in student life. For more information, contact Megan Daniels, MSE Undergraduate Advisor.